Men’s Thanksgiving Outfits. With Thanksgiving almost here, you might be looking for some last minute outfit ideas. Or perhaps you’re looking for what shoes to wear this Thanksgiving? Even if you have your outfit planned, we can always help improve it. 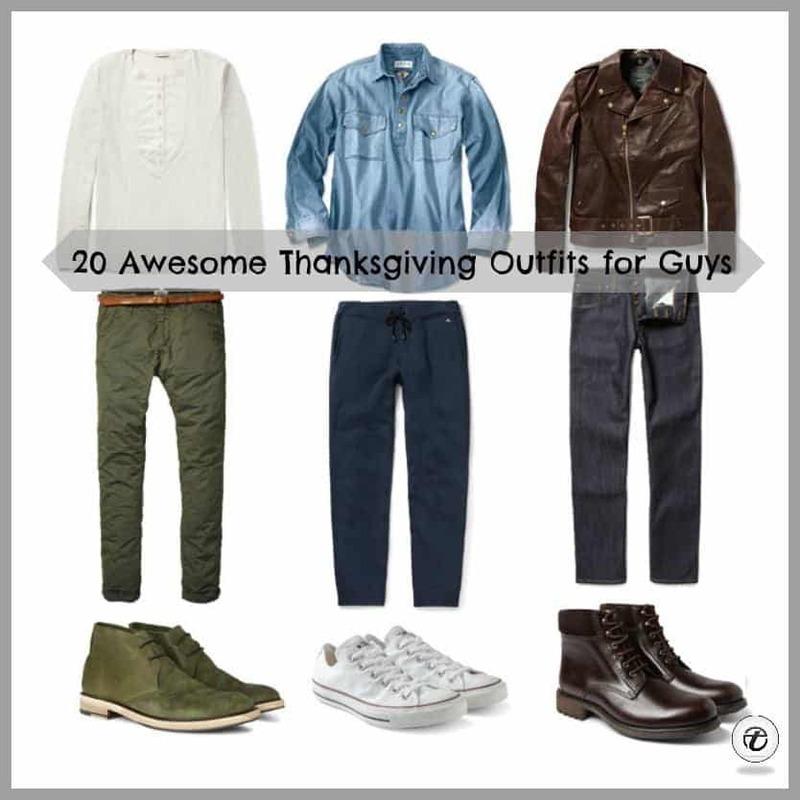 So here we have some carefully chosen thanksgiving outfits and styles that you’ll love and so will your loved ones. From casual to formal settings, to even road trip outfits for those who’ll be travelling home, we’ve got it all covered. Dress shirts and suits will continue to be the top choices for more formal thanksgiving settings, the top colors of the year for suits are shades of grey, beige, earthy tones, rich and inky blue and wine color. You can find most of these colors in our today’s collection to help you decide which one you like the best. Blazers can easily transform a casual look into a more sophisticated one. If you’re a sloppy eater with the Turkey, try wearing prints and patterns. Mix them up to spice things a bit. If you feel shirt and ties are too much for your taste, go for polo shirts and chinos to stay relaxed but look dressed up. If you’re wearing jeans, choose ones with maximum stretch. The safest option for those who’re looking for a last minute outfit. All black doesn’t just look great but it also suits every man. Here are some of the coolest Black Pants Outfits For Men. Thanksgiving is all about being comfortable and cozy with your loved ones and that’s what your outfit should be all about. Here’s a nice and comfy outfit that you can relax in all day long. The outfit includes a vintage white button-down shirt, slim fit corduroy pants, brown Reddington boots, knitted sweater, gloves and a plaid tie. Looking for something preppy? A shirt-sweater combo is all you need. Many of us love Thanksgiving because of what a calm and simple holiday it is. By the time Christmas comes, things are sure to get much hectic so Thanksgiving is the perfect chance to enjoy the calm before the storm. If you plan on celebrating Thanksgiving with your friends, here’s a nice and simple outfit worth trying out. Do have a look at 18 Ways to Wear Sneakers Fashionably. Here’s a closer look at those awesome shoes by Coach. White denim always makes for the coolest Thanksgiving outfit. And here are the top White Jean Outfits for Men. Many of us will be traveling home for the holiday and will be facing the years old dilemma, what to pack and what not to pack. We suggest to go with a single hand-carry and roll your clothes so they take up less space and also don’t wrinkle much. Have a look at these 20 Ideas What to Wear for a Road Trip for Men. Another warm and cozy outfit to stay comfy this Thanksgiving. Wear a printed bomber jacket with woolen check pants, the combination of patterns and prints is a great idea for this holiday. A wine colored velvet blazer is definitely part of the ideal and fun-filled guys night out attire. Check out 30 Amazing Men’s Suits Combinations to Get Sharp Look. Here we see some beautiful and warm Autumn colors that look great especially if you’re planning to spend some part of your Thanksgiving day in the outdoors. Don’t miss out these 18 Outfits with Bomber Jackets for Men. One of our favorite shoes of the season are these awesome sneakers by Hydrogen-1. They are a combination of the classic Moccasins and sneaker soles. Moreover, the chosen brown color is ideal for this season. For more formal thanksgiving settings, there is no other choice than a suit. Here’s one in not just great colors but it is also a very versatile one, it gives very modern vibes and most importantly, it’s super comfortable. Have a look at these 40 Best Fall Fashion Tips for Men. If you want to layer, wear a sweater over a blazer for a super sleek look. Fitting of your blazer is extremely important to pull off this look. When you want to look your best, a blue suit is something that will never fail you. However, wear it with the no-socks trend for a twist on the classic look. Also have a look at these 27 Ways for Men to Wear Shoes without Socks. Want to look like a grown-up, cool guy? To look like a gentleman, you don’t always have to wear a full suit with tie. So go for an outfit like this that’s cool, casual and comfortable while looking dapper enough for the occasion. Be a man of class and sophistication while maintaining your swag. Here are 20 Ideas How to Dress Like Gentlemen. A graphic t-shirt paired with your favorite jeans will make a good outfit if you want to stay at home this Thanksgiving or host a dinner at your place. Have a look at these Casual Wedding Outfits for Men. 15, 16 & 17 were horrendous but other than that everything else were great ideas! Thank you.